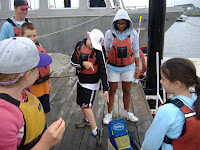 Friday was the final day of this summer’s Harbor Explorers Program at Courageous Sailing Center in Charlestown. We were able to go on two Green Boat voyages, viewing cormorants and terns in the Mystic Basin, watching fish jump out of the water, observing a few of the Harbor Islands, and excelling at Harbor Trivia (the kids at Courageous are so smart, and got almost all of the trivia correct!). I will miss our voyages as well as pulling up the lobsters traps when back on the docks. Thank you to everyone who helped to make it such a superb summer! Tuesday we had both sun and wind, so Level 3 and the Racing Class students sailed J22’s to Spectacle Island! It was a wonderful voyage, allowing us to practice navigation, view several of the Harbor Islands, and from the boat we could see comb jellyfish. Once on the island we fished off the pier, combed the beach for pottery and sea glass (and left it on the island), took in some sun, and made sandcastles. Back at Courageous, we pulled up a few lobster traps and found green crabs, red rock crabs, a sea star, and even a flounder (which had also swum into a trap). Finally a week of sun and great catches. This past Saturday I had a great time at the Dorchester Beach Festival on Malibu Beach in Savin Hill. All kinds of groups showed up, from the New England Aquarium to the Coastsweep Program to the UMass Boston Volleyball team. I, along with Matt Nash from the Department of Conservation and Recreation, led a series of programs on the beach where we taught kids about the life cycles of harbor animals and how to conserve the Piping Plover. We had a great game set up where kids pretended they were plovers, and attempted to collect an amount of "food" in a time limit. Once they did it without interruptions, and once they did it with disturbances, such as kids playing frisbee, kids pretending they were dogs, or kids flying kites overhead. Each time the kids that were plovers were interrupted, they had to stop collecting food and run up the beach away from the shoreline, just like a real plover. Everyone learned that even though we might be doing things on the beach we consider to be fun, they can be destructive to plovers and might even lead to them starving. We also led kids in a scavenger hunt on the beach, where we found lots of dog whelks, surf clams, and even a horseshoe crab. Everyone there, parents included, had a great time learning about all the interesting animals they might encounter at the beach. Yesterday was the perfect day to let the kids go for a swim. They really enjoyed jumping off the dock. It was a nice change of pace from the fishing and since it was really hot, the kids were happy to be able to cool down. One of the kids would not stop jumping in and I could not figure out how he had that much energy. It was a lot of fun. We put out a few hooks last week with bait in hopes of catching a nice striped bass. Once again, we were surprised to catch another lobster on our line! This lobster was a bit larger than the last with a 3.5 inch carapace. It also had no intentions of releasing the bait so we put both the lobster and the bait back into the water. We also had the lobster pot soaking with some bait. We pulled up the lobster trap and found about 8 red rock crabs and 2 spider crabs. Most of the kids had never seen a spider crab before and thought it looked pretty scary. After holding a few of them, the kids were gaining confidence around the crabs. Nice catch! We'll work on catching some fishing with our fishing rods and lobsters in our traps, but we still had a great day! 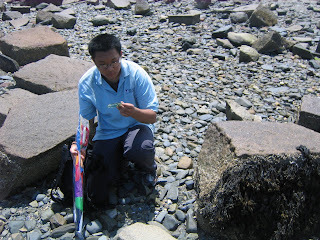 Out on Georges Island I always encourage people to look for beach glass or sea glass as some people call it. This is simply broken glass that's been tumbling around in the sand for quite some time and has become nice and smooth. If it's sharp we leave it for next year. Many people collect beach glass. I've been collecting beach glass for many years so I've included a photograph here of a small amount of the glass I have at home. My favorites are the blue and the most hard to find, RED. Can you find the red one in the photo? This is something to do after a long day of sailing and soaking up the sun. Seadna and Kathleen were enjoying every minute of the poster included with a lobster, crab, hermit crab, flounder, and a bass. They used a field guide to help them out a little. When the poster was done we hung it to dry and called it a day. Last week we went to George's Island and every day we had a full boat of 200 people. Before we left for the Island we all met at the Bank of America Pavilion for a short briefing and we also sang a sea scanty. Once we got to George's Island the kids and I flew kites, explored the beach for crabs and snails, and also skipped rocks which is always a blast. After, David took them up to the Fort where they went through the dark tunnel and met the "Lady in Black". George's Island is such a fun place to be I enjoy every minute of it. 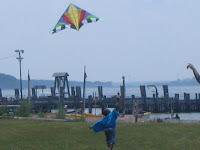 This week we went out to Spectacle Island twice and each day the kids had an opportunity to fly kites and go swimming. 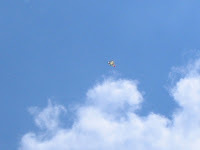 On Monday, I was up on the North Drumlin about 157 ft. high flying kites with the kids. After about 45 minutes or so we made our way down the hill and to the beach where we all went swimming and ended the day cool and refreshed. Only four days left, but they will be just as fun as the other trips this summer. At Georges Island I'm usually the one you see with the kites in my hand that you ask if you could have one and I have to say "no sorry we need these for our other trips." But sometimes you'll see me up in the fort showing people around making sure they don't get lost. Sometimes you might even see me on the beach with Frankie helping him out. But I'll always be the one teaching the kids how to fly kites like a pro. At Spectacle Island I'm the one that shows the groups good spots to eat. Afterward I help them organize any games the are trying to organize. Then I try to get groups to go up the hill and fly the kites with Frankie. Then we go back down the hill and get soaked by the rest of the kids that are at the beach. At Georges Island I’m usually the one you see with the kite in my hand that you ask can you get one but I say no because we need these for our other trips. But some time you will see me up in the fort showing people around and making sure they don’t get lost. Some times you might even see me down at the beach helping out Franky. But I’m usually the guy teaching the kids to fly kites by their selves. At Spectacle Island I’m the one that shows the groups good spots to eat afterwards I help them set up any game they trying to set up then get groups to go up the hill and fly kites with franky then go back down the hill and get soaked by the rest of the kids that are at the beach. I also act as if I cant swim to get them to teach me how to swim. Hello All Access! Today while fishing and tangling line on the fishing pier at Harry McDonough we had the pleasure of waving to the All Access crew as they returned from George's Island. Despite the fact that we did not catch any fish we had a great time seeing David, Frankie, Andrea, and Senait as they passed us by. Hi I am Marissa and I have been working with Aimee at Camp Harbor View. On this day, we decided to do a different activity with the kids. We decided to take a walk along the beach and find things like rocks, mussel shells, different kinds of crab shells, and other things we thought were cool and we painted them. Mark and Nnandi found some red rock crab shells to paint. They also found clam shells, mussel shells, and a horseshoe crab shell. The kids enjoyed learning about marine wildlife in this new way! Most mornings we meet on the stage of the Bank of America Pavilion to hear a little history about how Boston Harbor got to be so clean. So clean we can, and do, swim in it. But the most fun we have in the morning before we get on the boat is to learn a sea chantey. These are the work songs the sailors sang on board the old sailing ships, many of which were built right across the harbor from us in E. Boston. This is one of my favorites. Anyone named Joe (and some people whose name I change to Joe) comes up front to sing this with me. The name of the song is Haul Away Joe. It was most often used as a hauling chantey, mainly for hauling on the lines to raise the sails on the old sailing ships. The most famous shipbuilder, Donald MacKay, is celebrated with a monument on Castle Island (a miniature Bunker Hill type obelisk) with every ship he ever built carved into the sides. Go check it out. Way haul away, we'll haul away JOE!! 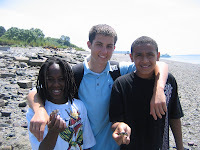 Every Wednesday afternoon the Piers Park Marine Educators and I head up to Winthrop Beach. 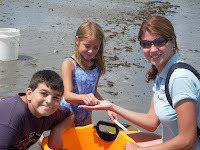 Each week, kids aged 4-10 come by with their parents and check out the tidepools. We always find all sorts of interesting things! From lobster claws to barnacles to the biggest blue mussels I've ever seen, Winthrop Beach has it all. When we first arrived, the tide was very high, so we decided to take a walk along the beach and check out the wrackline. Kids spotted lots of washed-up, dead crabs, and I helped them identify green crabs, red rock crabs, and Asian Shore crabs. Eventually, the tide went low enough for tide pools to form, and everyone waded into the water, carefully lifting up rocks as we went so that we wouldn't crush the little crabs that would scurry out. Although at the beginning, some children were a bit afraid of holding the little critters, by the end of the day, there wasn't a kid in sight who didn't want to be the first one to pick up a crab. 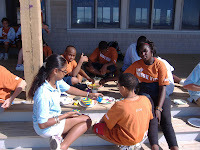 This Wednesday, our last session, we had a record 16 kids come to Winthrop Beach. Hopefully, next year, we'll have even more! 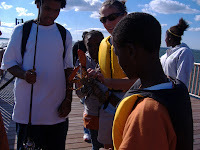 Crabbing off the docks never gets old for Boston Harbor Explorers in Dorchester! Once again, we used the crab traps to see which group could find the most crabs. In the beginning, we were using hot dogs as bait. The kids soon learned that crabs like to eat mussels too! 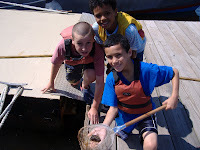 Here are a few boys who were successful in finding a mussel attached to the dock. We caught many more crabs using the mussels than the hot dogs, why do you think that is? We brought up one of the traps and one of the explorers commented that one of the crabs looked really strange. It was a pregnant green crab! You can click on the image on the right to enlarge it. Look at the crab's "belly" area and you can see the large mound of eggs. Reproductive events vary by the size of the female, but most females can produce over 150,000 eggs in one event! We made sure to take the female crab and put her back into the water gently. 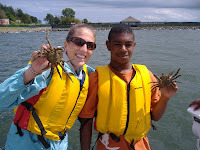 At the end of the day, the campers exclaimed that they caught over 155, 000 crabs! Although I wouldn't let them count the eggs in our crab count, they did find an astonishing 55 green crabs that day! Another great day in Dorchester! Sometimes things get so busy at Save the Harbor / Save the Bay in the summertime that we don't have time to enjoy all the great things you can do on Boston Harbor. Yesterday I had a chance to go to Georges Island on All Access Boston Harbor with kids from the Somerville YMCA, Camp Harbor View, and some volunteers from Skanska, a construction company that is one of our long-time youth program partners. We all had a great time, and all of us did things we had never done before! We met at the Bank of America Pavilion , where Frankie, Kat and David introduced us to Harry the Lobster (Larry's younger brother). 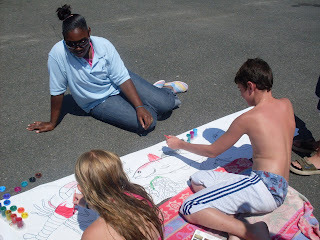 The kids from the YMCA had a great time with Ibi working on this weeks murals. They also enjoyed using the field guides, and touching the tiny skeleton shrimp we found under the dock. Before we left for the island on the boat with Captain John, David told us all what to expect and then taught us to sing a Sea Shanty, "Haul Away Joe!" When we got to Georges, we ate lunch, explored the fort, looked for crabs on the beach, and learned how to skip stones. We also cleaned up every bit of trash we carried onto the island! On the way home we saw Kat and her crew at Castle Island. We got back to the pavilion before the big thunderstorm, just in time to hear Theo Epstein's band perform a sound check. They were great! I'll try to post a short video of David and everyone singing and some picture from Georges Island over the weekend. and the many fishing lures we’ve lost, we came across the ever so popular skipping rock. We each took our hand at skipping along the ocean surface. After skipping for a while, we decided these rocks, so thin and flat, needed some pizzazz, some color! After a short while our bucket was full and we were ready to paint. By the end of the day we had an amazing amount of colored rocks. 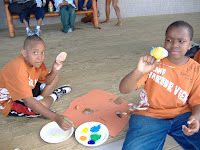 Some rocks were painted bright colors, others had designs, and some even had drawings of sea creatures. Before we knew it all the rocks were painted and we were eager to find more! This past weekend I was lucky enough to spend some time with the kids on Winthrop Beach for the Winthrop Beach Day event. The weather was great and the live music was amazing. A bunch of kids joined me along the beach and in the water with dip nets in hand to capture as many creatures as we could. 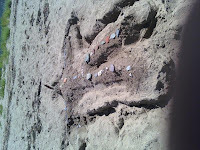 I was amongst expert crab collectors and one sand shrimp specialist. By the end of the afternoon we had 3 buckets filled with Asian Shore crabs, Green crabs, Red Rock crabs, Sand Shrimp, Clams, and Hermit crabs. We also found an unusual crab skeleton and it turns out it was a Lady crab. Thanks to my many collectors we had a lot of fun animals to play with! Hello, my name is Hei, and I work with Save the Harbor/Save the Bay as an intern from the ABCD Summerworks program. Last Friday, I was able to go with the All-Access Program to Georges Island once again. As usual, David began by explaining the rules on the island, and by describing the various types of activities that were available on the island. He suggested that everyone tried to do something that he/she had never done before. Although dark clouds loomed endlessly in the sunless sky, all the youths still seemed rather excited and optimistic. After we arrived on the island and ate our lunches, we separated to proceed to our “stations” at different parts of the island. While Frankie and Jenny explored the beach with some youth groups, I went to one of the higher point near the beach to fly kites. Unfortunately, despite the gloomy weather, there was not much wind at all. (If it started raining, the wind would be strong, but the kites would have gotten soaked) I only had a few kites set up, because David has warned them ahead of time that the wind was weak today. Although I managed to get the kites up into the sky a few times, they would quickly fell back down after a short period of time. Most of the groups spent a majority of their times inside Fort Warren. When it is almost time to go, a few kids, along with their mentors, came by and tried to fly the kites. Although the kites did not stay up in the sky for very long, it was fun seeing the kids enjoying themselves with the kites. All we could do was to hope for a better wind next time when we came to the island again. Using an underwater camera is a great experience for the kids. We put the camera near our traps to see if we could see any crabs coming our way. Some kids spotted small schools of silversides passing by. We also used the camera to look under the nearby boats. Someone has some scrubbing to do! In Dorchester, we were able to look under the docks to see the anemones, orange sheath tunicates, mussels, and sea squirts! The best part was looking at the "dancing" skeleton shrimp; they were everywhere! We all enjoyed the opportunity to look beneath the ocean's surface using the underwater camera. On Monday, we had our Staff Appreciation day. After some delicious hot dogs, blue fish, and grilled peppers, we headed over to the New England Aquarium. As soon as we got in, we headed straight for the "Sharks and Rays" exhibit we've heard so much about. As I've seen dozens of advertisements every day on my way to Harbor Explorers at Piers Park, I was very excited by what we were going to see. It turned out I was not disappointed. 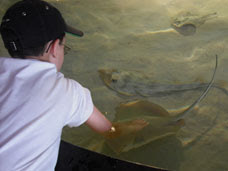 The aquarium had set up an enormous touch-tank, featuring animals like southern stingrays, bamboo sharks, and guitarfish (the "link" between sharks and rays). The rays felt really strange - it was almost like touching a jellyfish, except less squishy. Touching the sharks, on the other hand, was like petting sandpaper. Although a few kids around us were a bit scared to be touching "dangerous" sharks, they were all very tame and didn't seem to notice us petting them at all. We weren't able to stay for too long, however; the exhibit was extremely popular and many more people wanted to get to the tank and touch the animals for themselves. What an awesome way to spend a rainy day! Despite the rain I had a really good day on Staff Appreciation Day. We ended up cooking out at the Constitution Marina in Charles town with the company of Grove snails and Periwinkles from Lovell Island. The steak tips and chocolate chip cookies were my favorite. After the cookout we went to the Aquarium. My favorite animals there were the turtles and the penguins. Finally for desert I enjoyed my chocolate chip cookie dough ice cream. Complements to Bruce and Patty! On Friday I went to Georges Island with Frankie. When we first got there we all ate lunch. Afterward Frankie and I took some kids down to the beach at Georges. While we were down there we skipped rocks and looked for cool shells and rocks. The kids loved it when Frankie lifted up the big rocks where crabs were hiding underneath. The kids also had a good time collecting sea glass and smooth rocks. The boat ride was also a lot of fun. Everyone had a great time. Here are two more murals for you to enjoy. The outlines were prepared by our artist-in-residence, Ibrahim, and the murals were completed by the young people who take part in our "All Access Boston Harbor" Program at the Bank of America Pavilion in South Boston. Stay tuned for more in this series later in the week! Even though yesterday's rainy weather forced us to cancel our planned summer staff outing to Spectacle Island, we managed to have a great day on the waterfront! We held our cookout on the deck (and under the awning!) at Constitution Marina in Charlestown, where we cooked hot dogs and fresh bluefish and shared lunch with two different kids of snails, periwinkles and grove snails from Lovells Island in the Boston Harbor Island National Park. Then we took a water taxi to the New England Aquarium, where we saw harbor seals, sharks, penguins and exhibits about Jelly-Fish and Stellwagen Bank, followed by a complimentary ice-cream cone from the Emack and Bolio's at Long Wharf. Here's a copy of the picture we took at the dock before we went to the Aquarium. If you look closely, I think you can see Darius holding a very wet - but still delicious - cookie! All in all, not a bad way to spend a rainy day! At Courageous this week we experienced crazy weather! Despite all that rain, we still pulled up all the lobster traps and used the water quality test kit. We examined the pH, and tried to see if the rain created more bacteria in the water. A lobster boat has put a string of pots around the dock, so we are guessing that our lobster count may decline (they use really good bait). The Cruising class discovered what looked like a skull on Rainsford Island. What does it look like to you? Pat thinks that it is an Egret hip-bone. There we were, fishing off the docks at Camp Harbor View on Long Island. One of the kid's yells, "I've got something!!". Everyone runs over as he pulls up his line; you can see the anticipation on everyone's face. We look over the edge expecting to see a fish come sailing out of the water. Will it be a flounder, a striped bass? No, it's a lobster! Here is Marissa with our successful (and surprised) fishermen! This lobster was very young and its carapace measured only 3.5 inches. After passing it around and observing it on the dock, we let the little lobster go back in the water. What an interesting catch! Last Friday I had the opportunity to take over for Aimee on her day off at Quincy and Camp Harbor View. Since I've been at Piers Park all summer I wasn't really sure what to expect. Quincy Rec turned out to be awesome - espescially since it was so different than Piers Park. Quincy is located on a salt marsh and there were lots of different animals and plants to find. We saw egrets, mummichogs, and someone even caught an eel! That afternoon we drove out to Camp Harbor View on Long Island. This too was a completely different experience. We ran a fishing club out on one of the piers where it was at least twenty feet down to the water. All the kids got a buddy and took turns trying to see how far out they could cast their lines before they hit the water. 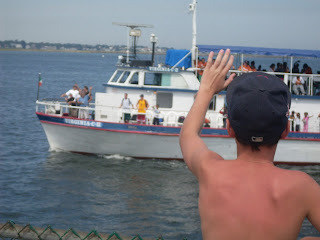 The kids also had a great time waving to boats passing by and watching the huge difference between high and low tide that happened while we were there. Both locations were beautiful. It was nice to get out of the city for a day, but I was excited as ever to return to Piers Park on Monday! 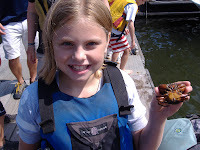 Hi my name is Kelly and I am a Junior Marine Educator at Save the Harbor Save the Bay. I work at Piers Park in East Boston as an assistant to Pat and the Harbor Explorers. 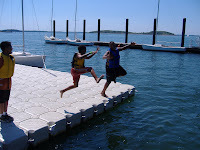 A typical day at Piers Park begins with a game of “crab tag” or a game of “sharks and minnows”. After the game Pat and I take the kids down to the dock and go crabbing, fishing, and pull up mussels from the dock. In the mornings Pat pulls up the lobster trap, yesterday we pulled up many crabs, a lobster, and a sea star. 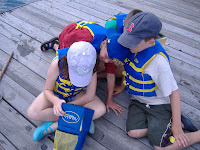 We bring a cooler and a bucket on the dock and place the animals in them; the kids really enjoy playing with the sea creatures we find. I do that from Monday to Thursday, on Fridays’ I have to go to the Agganis Arena for John Hancock and listen to guest speakers. The speakers normally talk about being professional during work and give us helpful tips about how to get ahead in life and in our jobs. Today we went to Piers Park but it was raining so we played harbor related games with the kids and drew pictures about the animals that live in the harbor. We went out fishing for a while but then the rain picked back up so we had to retreat to the tent to stay dry. After Piers Park we went to Winthrop Beach. It was raining so hard we eventually had to leave. My new site in East Boston. Hey this is Andrea. Currently I'm in East Boston. With our first group we go crabbing and fishing. Then after lunch we either crab and fish with another group or go to a beach and see what we can find. Today though it was raining to things were a little bit different. We played more games, but when the rain lit up for a bit we fished. Then it started to rain again so we decided to go back to the tent. The kids drew a picture to what was under the pier. They drew crabs, fish, sharks, rays, and sea stars. For the last half hour we played charades. Hey this is Senait. I worked at Piers Park East Boston this week. We caught some crabs and lobsters and we went fishing too. 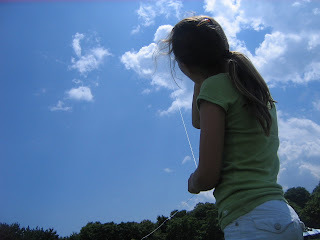 The kids like fishing but they get the lines tangled most of the time. I have fun fixing them. Piers Park is different than South Boston because there we can go into the water and go swimming, and there are many places to do crabbing. 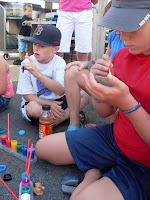 Even though we can't do these things in East Boston we have lot of fun with the kids. Getting to know new kids is fun too - there are so many different names and faces it's like a new job and I like it. At East Boston there are a lot of places to go. 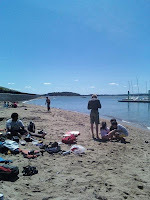 We go to Constitution Beach with the "Y" kids, Revere Beach, and Winthrop Beach. There are so many places to go and see so many new things. Hi my name is Basima and I work with Save the Harbor Save The Bay as a Junior Marine Educator. Today I started at the Harry McDonough Sailing Center in South Boston. I spent the entire day with the kids fishing off the rocks waiting for a bite . The kids were very interested in and dedicated to this activity. Everyone was participating and enjoying themselves including me. I'm also looking forward to working at the Harry McDonough and having a good time. In this short clip, Michael is showing the pincher and crusher claw of the lobster we caught this week. The larger claw, on the left side of the lobster, is the CRUSHER and the long slender claw is the pincher. Any guesses on what the crusher claw might do when eating? 1. You could go on the beach and skip stones, find beach glass or you could catch crabs. If you are interested then you should meet Frankie, he will be the one to show how to do all those things. 2. 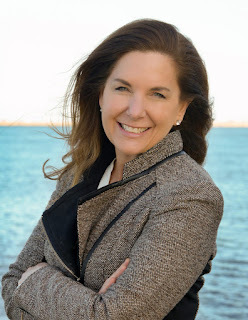 You could sing sea shanties, go explore the dark caves of Fort Warren that is said to be haunted by the Lady in Black with David the "creepy tour" guide. 3. I've saved the best for last: you could learn how to fly kites with me, Darius! I will also show you how to put it together. By the time you leave, you will be the world's best kite flier!